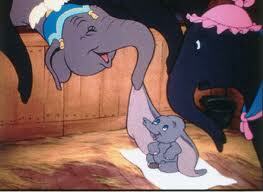 One of my daughter’s favorites at the present moment is 1941 Disney flick ‘Dumbo’. One of my childhood faves, it’s not hard to see why. Here are some lessons to learn from ‘Dumbo’. Disclaimer: Obviously the images are all from Google and even more obvious the list will go from sentimental to sarcastic humor. It’s Not All About Being a Princess. Dumbo is not about being a princess or being in love or meeting Mr. Right. It gets away from that, which is just fine for little girls. It’s about learning to love and embrace what is different from you and learn to let it work for you.